I started training with Optima Racing Team in 2008 where James Beckinsale is the head coach. Despite a busy lifestyle, working full time and being a mother of two children, I’ve managed to get some top age group results and that I thank to James and Optima Racing Team. Not only has James taught me how to swim, cycle and run properly. His focus on quality as oppose to quantity, his enthusiasm for the sport and endless support really has transformed me as an athlete. After 3 years I’m still improving and most importantly I’m still looking forward to every session. 2009 Icelandic National 20 km, TT champion and reccord holder. 2010 Ironman Australia – Port Macquarie 23 rd overall, including professionals. 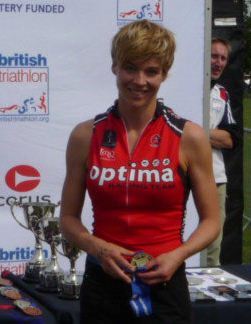 2010 British Sprint Championships, 1 st Female overall, course reccord. Multiple wins and podium places in the UK and in Iceland. Thames Turbo Triathlon course reccord holder. National Sprint MK course reccord holder. Voted female triathlete of the year in Iceland. 2011 Ironman Austria – aiming for gold!